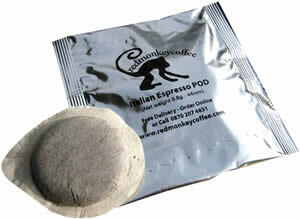 coffee PODs uk - order online - fresh roasted, ground and sealed espresso PODs. Note PODs are now Espressionie PODs, different design on packs. The pod system offers remarkable convenience, no need for grinders, perfect portion control, no mess, and cleaning. Maximum consistency, the PODs are encapsulated in paper to the optimum tamping pressure for the same perfect espresso every time. Note PODs are now Espressionie PODs, not as in picture. All PODs are individually sealed in an oxygen free laminate pouch. The PODs can only be used in E.S.E machines which except PODs like the Francis Francis machines and most of the Gaggia machines.  Size 44mm pods, 6.8g weight, Fine grind For espresso pod, ESE or pod adapted machines. Orders are normally dispatched by the above method within 48 hours. A bright, clean flavour typical of quality espressos. Popular in Northern Italy with Connoisseurs all over Europe. 44mm, 6.8g each, individual sealed. A smooth tasting, powerful Neapolitan espresso. 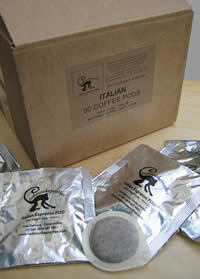 Full Coffee flavoured with a hint of the earthiness that is so popular in Southern Italy. Italian Espresso Coffee Naturally Decaffeinated.